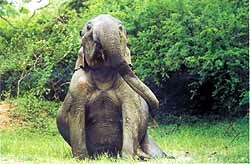 Sri Lanka once at the forefront of bio-diversity conservation in Asia has failed to keep pace. Conservation, necessarily a part of existence rooted in the countrys culture of harmonious living has long ceased to be such. Today it has the mien of a battle by few against many odds. Dr. Eric D Wickramanayake, Senior Conservation Scientist of the World Wildlife Fund in the editorial of the April issue of the Sri Lanka Nature magazine (published by the Bio-diversity and Elephant and Conservation Trust on a non-profit basis) says that the country has failed to adopt and implement contemporary approaches to conservation. "We now have a protected areas system that neglects the most important facets of our bio-diversity, the fauna and flora of the wet zone rain forests. The wet-zone forests receive step motherly treatment, and are being rapidly encroached, deforested and converted into vegetable gardens," he says. He adds that the protected areas system is also over-burdened with parks that do not contribute to conservation, many either being too small to be of much use or now degraded to the point where they do not harbour natural bio-diversity. The issue in its entirety deals with the many parks and natural reserves scattered around the country. 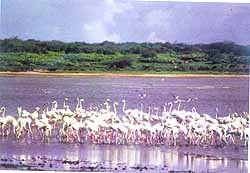 The status of Bundala, Horton Plains, Ruhunu National Park, Wilpattu, Udawalawe are explored at length. Among the writers are veteran conservationist Lyn de Alwis and Dr H I E Katugaha. The articles are a mix of fact and anecdote, with a travelesque tinge. Invariably the exploration is in terms of what once these natural reserves were as against what they are today. The wonderful pictures are those culled from both private collections of long time wildlife photographers and the inexhaustible archives of the Studio Times. The issue is not a negativist lamentation of the beauty that once was, rather a celebration of the eternal beauty of the environs. They exhort the need to preserve those precincts that are far ancient than even our memories. The pictures capture Horton Plains in its many moods, the plumed songsters of Bundala, the varied life of the Ruhunu National Park, the play of the jumbos, a python disgorging itself and much more. The Nature portfolio a single photo spread over a double-page is of a menacing croc displaying its cavernous mouth, captured by young nature enthusiast Wajira Wijegunawardena. What conservationists seek to do politics will as easily undo, because conservation is determined by state policy. Politics as always lies at the root of regression in conservation policy. The Department of Wildlife as Dr Wickramanayake contends, sports no real leadership in its upper levels, the Directors office serving merely as a turnstile position with a high turnover in appointees. Effective performance it seems has sadly a negative co-relation to the time spent in the hot seat. Nepal an entrant into contemporary conservation long after Sri Lanka is exampled as a model to follow. The primaries of its methods are people involvement, with tourism as an economic incentive for protection. The solution he says is one that must cut into the core of our conservation policy. "We have to reevaluate our protected areas system and establish conservation priorities." The greatly boasted 12 per cent protected area is it seems just a great boast. What we need he says is "to perform a gap analysis to identify the facets of bio-diversity (species and ecological processes) that are unrepresented or under-represented within the protected areas system. Ineffective protected areas he says can be exchanged for other areas to make the system more representative of Sri Lankas bio-diversity. The fundamental however remains unchanged - sound protection coupled with effective management policy. Or else we are doomed as a has-been even in the area of conservation. Meanwhile the kaleidoscopic beauty of nature and its serene experience -if nothing else- should inspire us to join the few who battle to save much.